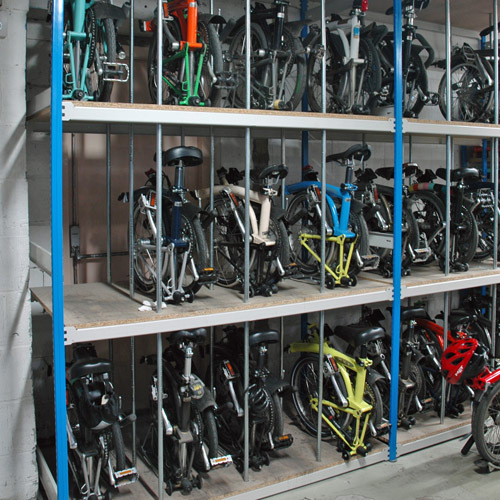 Our range of bicycle and accessory storage products can be used by individuals, retailers, manufacturers and organisations to provide safe, secure and practical storage areas. Here we present you with several of our most popular bicycle related solutions to give you an idea of what can be achieved. If you have any questions or if you would like to discuss an upcoming project then please call us on 01993 779494. 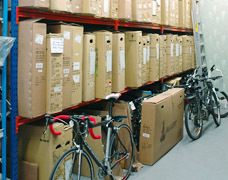 Bicycle retailers have unique storage requirements due to the huge variety of differently sized products that they offer. Careful consideration has to be taken to ensure that enough storage space is allocated to the different types of product, whilst maintaining large enough access aisles for the safe passage of assembled bicycles. 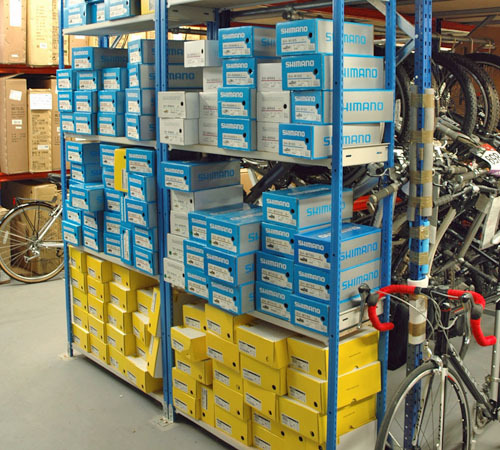 Our varied range of storage products are perfectly suited to retail shop shelving, each one can be configured to suit any bike retailer's specific requirements. 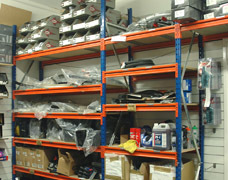 This creates an optimised stockroom based upon the actual stock profile. Cycling shoes can be a particular headache for bike retailers, the vast range of sizes and styles on offer for both male and female riders requires an awful lot of space to be allocated in the stockroom. The EZR Trimline shelving system is a well-proven commercial solution for shoe box storage. Slim shelf beams keep wasted space to a minimum. Adjustable shelf heights every 25mm also allow each storage rack to be set up differently to suit the stock profile - an important feature when you consider that shoe boxes can come in a variety of sizes. 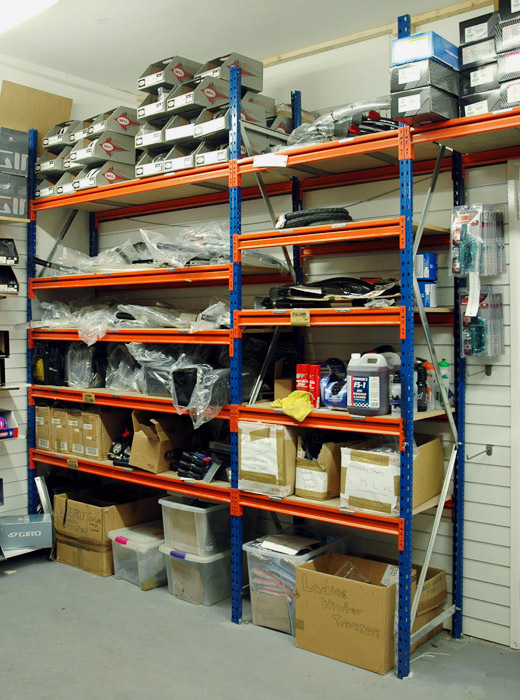 The local bike shop is still a popular choice for cyclists to purchase spare parts, upgrades and consumables. However, keeping the vast array of items required to cater for a whole spectrum of riders is a huge challenge for the retailer. Everything from the smallest nuts and bolts to brake levers, chainsets, saddles and awkwardly shaped items like mudguards and wheels have to be stored in a way that is practical and easy to locate. Longspan shelving is the ideal solution for bike accessories with extra-wide shelves for storing the various shapes and sizes of cycle accessories. Heavy duty shelf beams and solid frames provide a sturdy platform for storing bulky items and boxed goods whilst a 50mm height adjustment for each shelf lets you arrange the storage rack exactly how you need it. A wide range of sizes are available to create a storage solution that will fit perfectly within any shape or size of stockroom. If you want something a little extra included like an assembly table or a mobile storage trolley, our design team can easily incorporate this for you. 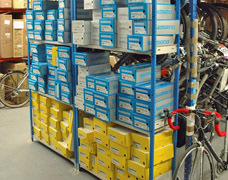 Bicycle retailers have a unique requirement for storing large quantities of heavy and awkwardly shaped boxes within a small stockroom. Heavy duty longspan racking is the ideal choice for boxed bike storage thanks to high shelf load capacities and easily adjustable shelves that are perfect for hand loading and unloading of bulky items. 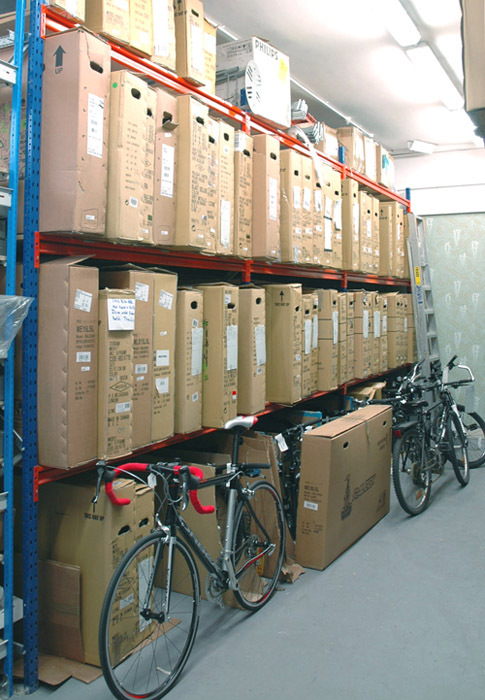 The example opposite shows how 3 bays of racking can store up to 72 boxed bicycles within a relatively small warehouse or stockroom, with enough space on the top shelf to allow the storage of other cycle accessories. Longspan shelf beams are adjustable on in height to minimize wasted space between each level and can be supplied with either chipboard shelves or steel shelf panels. Shelf depths of up to 1200mm and widths of up to 2400mm provide large shelf openings for the convenient storage of pre-assembled bicycles. We have supplied a variety of storage solutions to bicycle manufacturers, wholesalers and retailers - each with individual designs to suit their requirements. Contact us for free help and advice about our full range of bike storage solutions. When you need to store folding bicycles like the popular Brompton bike, we have 2 solutions that have been specifically designed to offer practical and efficient storage in both indoor and outdoor locations. The compactness of folding bikes when not in use allows a large quantity of bikes to be stored within a relatively small space. This means that very cost-effective storage solutions can be made. The 8ft high, 3 tier bike racking system shown (below-right) is built using strong EZR Trimline shelving with 60" wide spans and 30" deep shelves to provide storage for 12 folding bikes per bay. Divider bars are inserted into pre-drilled shelf boards as a simple and cost-effective way to create the storage sections for each bicycle. 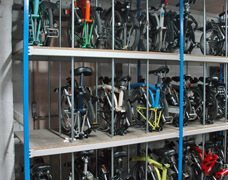 A range of racking sizes are available to suit your specific bike storage requirements, our modular shelving systems can be adapted to suit just about any cycle storage project. 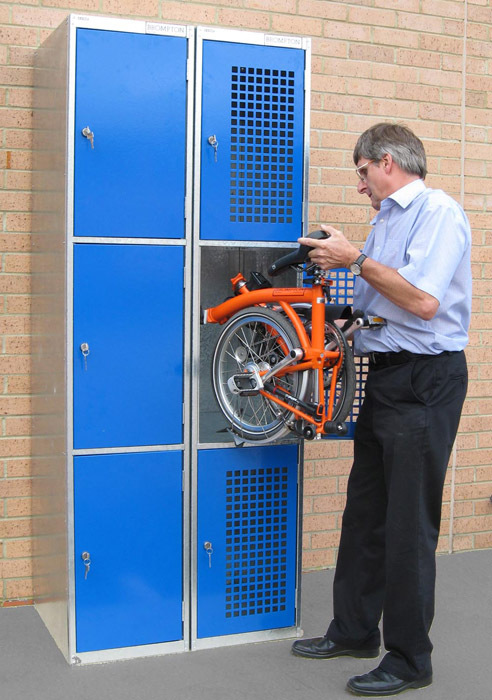 The locker units shown (below) have been designed to accommodate 3 folding bikes per unit, made from galvanised steel, these bike lockers can be used outside (under a canopy) in a number of applications. This solution is now available to order online, please see our Folding Bike Lockers product page for further details and pricing. 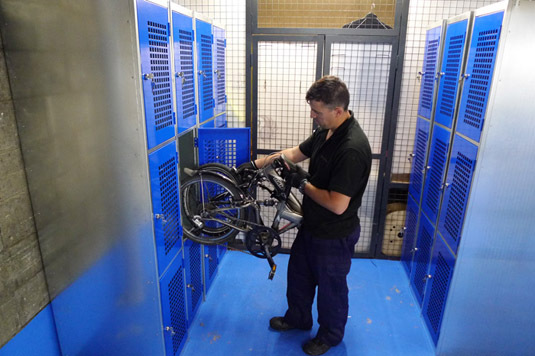 These cycle storage systems are ideal for companies and businesses that provide bike locker facilities for staff members especially in London where the folding bike is a popular choice for commuting. 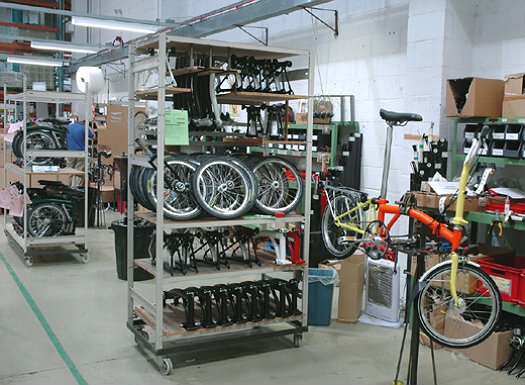 Bicycle manufacturers can benefit from our specially designed mobile shelving trolleys for the storage and transportation of cycle components in bike assembly areas. Line-side production requires components of varying size and colour to be readily available to meet the required specification. Having the right components to hand can improve efficiency and help to reduce the overall build time. The photos here show how a cycle manufacturer uses EZR wheeled shelving units to store not only components but also completed bikes. As the mobile trolleys are based around our modular shelving system, the shelves can be easily configured to suit wheels, handle bars, seat posts, forks and frames. As parts change within the life-cycle of the product, storage sections can be simply adjusted to adapt. Static shelving and wheeled shelving units are available in a range of sizes and can be designed to suit your specific needs. 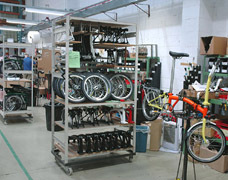 Contact us today to find out how we can improve your bicycle assembly areas with our high quality shelving products. Contact us today to discuss any of the bike storage solutions featured on this page and to obtain a free quotation.